This afternoon I'm cooking for the brethren. Given that I'm aware that there will be a formal dessert course to mark a special occasion, a certain dilemma arises. It's a small dilemma, but one that illustrates the form of many tensions and decisions in religious life. My dilemma is this: In setting the table, do I set out the dessert forks in their proper place, knowing that I will be annoyed when the brethren use them for the salad, or do I, armed with this knowledge, reserve the dessert forks and provide them only once the dessert is served? As in a great many dilemmas in religious life, the choice is between suffering for insisting on what's right, or compromising, 'working within the system' as they say, and thereby attempting to avoid aggravation and awkwardness. Of course, different moments and situations call for different responses. The prophet Amos wouldn't have gotten much done as a pastor; after all, he was asked to resign after one sermon. On the other hand, it can be a terrible uncharity to be codependent on the voluntary faults of others or to be 'pastoral' in the pejorative sense of being nice and giving everybody what they think they want, as if God treats any of us that way. Nevertheless, as meaningless as it is in any consideration of ultimate concern, in my dilemma about the dessert forks today I see the form of a multitude of struggles. Something struck me while I was offering Mass this morning, which, I'm surprised to say, I had never noticed. Like many of the churches and chapels where I say Mass these days, a free-standing altar is set up in front of a tabernacle set centrally in the sanctuary. Thus, in order to offer the Mass versus populum, the priest must place himself in between the altar and the tabernacle. All of a sudden, even though I have offered Mass this way hundreds of times, from the Mass of my priestly ordination on Our Lady's birthday in 2007 down to today, I felt uncomfortable to find myself with my back to the Blessed Sacrament. It's funny; the common objection to the liturgy celebrated ad orientem liturgicum is that the priest has his 'back to the people.' But isn't it more troubling for the priest to turn his back on the Presence of Christ in the tabernacle? So now I'm going to throw out an alarming suggestion and see what happens. If you are going to have the tabernacle centrally placed in the sanctuary, and there are any number of reasons and intuitions to support this, then the Mass ought to be offered ad orientem. If instead the Mass is offered versus populum, then our immediate ancestors were right in their decision that the Blessed Sacrament ought to be reserved somewhere else or in Its own chapel. After Mass at the Poor Clare nuns this morning, one of the older sisters came into the sacristy and greeted me. "I like the way you think, and I want to give you something." She then produced an old holy card which had been given to her by another Capuchin, Fr. Venantius Buessing, when he was giving the nuns a series of conferences in 1960. You can see a picture of Fr. Venantius on this page. He's the one with the outstanding beard, como Dios manda. The holy card depicts the elevation of the sacred Host after the consecration, with Christ crucified mystically present and server and people kneeling before the altar. On the back Fr. Venantius wrote a prayer, which I transcribe as best I can, though I can't make out the whole thing. I don't know if this is his composition or if it's from somewhere else. If anyone knows, speak up. Mirrored my image I behold! Thy Sacred Blood be my salvation! Be henceforth modeled after Thine! Which my whole being must reflect. A Christ-like priest I may behold! The other day after Mass I got into a conversation with a certain man who had endless questions. He was inspiring in a way, in that grace had put a devout curiosity into his mind and he was running with it. One of the things that interested him was the idea you hear sometimes about a certain light that is experienced near or at the moment of death. He wanted to know whether I believed in this light, and what I thought it was. I had to say that I hadn't thought about it much, but the conversation came back to me when I was praying through St. Irenaeus in the Office of Readings this morning: "...to follow the light is to enjoy the light. Those who are in the light do not illuminate the light but are themselves enlightened by the light. They add nothing to the light; rather, they are beneficiaries, for they are enlightened by the light." Maybe it's not that the light comes for us at our death. Maybe the light is here now, but we are insensitive to it, its visibility obscured by our distraction, confusion, and sin. Perhaps it's not that the light appears at the moment of our death, but that the occasion of our death provides a finality and clarity that allows us to see the light that was always there. Death is the end of personal history, the moment at which our existence ceases to be subject to any revision; we have been who we have been, and there is no longer any changing it. No more choice for good, whether in heroic virtue or in the unglamorous little moments of charity out of which true love is built, and no more surrendering to the law of sin and death, by which we insist on our alienation and misery in so many ways. Perhaps the clarity provided by this finality, this done-ness, clears enough of our distraction away so that we may see the light that was always there. The good news is that we can follow the light without being able to make it out clearly. We can be enlightened by it even though it still seems invisible. Though this interior illumination remains obscure for us in this life, my suspicion and my hope is that the light revealed at death will be recognized as the same illumination, only more clearly and fully visible. May the Light from Light, as cloudy as his illumination may seem to me now with all of my distraction, confusion, and sin, not only enlighten my soul but set it aflame with the Love for which I and every creature was first spoken into existence. O.k. ; this is a little ranty. I apologize in advance. I, on the other hand, am grateful for it, not just because it's a more proper translation, but also because I feel like I've been subjected to so many liturgically abusive first-person plurals over the years. Maybe that's a bad reason, I don't know. In the most direct case, how many times have I been at Mass, only to begin saying the Creed with 'We believe,' only to hear others around me changing other parts, leaving things out, and adding other things in? In that case I'm grateful that others are now saying 'I believe.' Their version of the Creed--because they know better than constant, conciliar tradition--can be their own, and I don't have to be implicated in it. In the broader sense, though, so many times have I been at a Mass and had the presider say things 'We gather for...' or 'We break the bread for...' or something like that. Often I felt like speaking up and saying, 'I don't.' If you're going to make up your own Mass and need it to be about you, leave me out of your 'we' thank you very much. Perhaps it's wrong for me to see the 'I' of the new translation of the Creed as a blessed relief and refuge from the oh-so progressive clericalisms of the liturgical abusers. Nevertheless, I'm grateful for it, and I pray that God will use whatever is in me to make me a more faithful and obedient steward of the sacred mysteries. You certainly hear some far out conversations in religious life. One of the brothers had selected Ducote and Daigle's "Remember Your Love" as the hymn for Evening Prayer, which of course led everybody, with the tune still in their heads, to sing Willy Wonka's "Pure Imagination" while we were doing dishes. I mean, listen to them; they're pretty close. In the midst of all the fun of trying to remember the words, one of the brothers, the one washing the pots at the sink, was discovered in the dissent of humming "The Girl from Ipanema." "I know that song! What is it?" "It's 'The Girl from Ipanema'"
"Oh yeah! Wasn't that sung by somebody in a big hat?" Another Ash Wednesday, and with it the hope for a new beginning of the Christian life. This is my twentieth Lent already, and since I was baptized when I was twenty years old, that means that in another year or so--should God grant me to live that long--I'll be able to start saying that I've spent most of my life on earth as a Christian. I'm thoroughly convinced of my own interpretation of Ash Wednesday, namely that it is public, communal, purposeful disregard for the gospel that serves to confess to God and to each other that this is who we have been all along, people who have heard the good news and received the divine invitation, but have not yet surrendered, not yet lived gospel lives. What else could it mean to proclaim the gospel that tells us to wash our faces when we fast and not to perform righteous deeds that they may be seen, and then eagerly line up to have someone put dirt on our faces with great solemnity and then walk around like that all day? I wear the ashes because I want everyone to know--and to remember myself--that I am a gospel-disregarding hypocrite. But within that confession is the hope for a new beginning, to do penance, to amend my life, to repent and believe the gospel once again. Nevertheless, as attached I am to this understanding, there are other things going on with Ash Wednesday. One of them I didn't start to notice until I was a parish priest and was baptizing babies with some regularity. At the beginning of the celebration of infant baptism, the families are met at the entrance to the church. As the names of the babies are called out, the minister of baptism makes the sign of the cross on the forehead of each, inviting parents and godparents to do the same. With this, the minister announces that the Christian community welcomes her new member with joy, and that the child is 'claimed' for Christ. It strikes me that this signing at the beginning of the celebration of baptism is the same ritual gesture that is used to give ashes. (I concede that this is not the custom everywhere.) When I receive the little cross of ashes, I think of how it relates to the sign of the cross I too received at the beginning of the ceremony of my own baptism. (Despite being twenty years old at the time, I was baptized according to the rite for children, long story.) It's as if that first sign of the cross, full of hope and joy, is now revealed again as necrotic, my first fervor having been burnt up and being nothing but weightless ash. The baptism that was to give me new life by burying me with Christ in his death has been foiled by the life of death I insist upon for myself with my sins and distraction. On Ash Wednesday I admit this, confess it to God, myself, and everyone else, and hope for a new beginning that I might prepare myself for the renewal of my baptism at the great Vigil of Easter. Still another angle that comes to me on Ash Wednesday is its relationship to Holy Thursday. It strikes me that the ritual by which we begin the journey of Lent, Ash Wednesday, is parallel to the ritual by which Lent gives way to the days of the Paschal Triduum, the Mass of the Lord's Supper. On Ash Wednesday we insist on not following Jesus' practical advice on how to fast, but on Holy Thursday, in the washing of the feet, we take great pains to act out a gospel commandment that can easily be taken figuratively. We begin Lent with a direct violation of the gospel on Ash Wednesday and conclude with direct imitation on Holy Thursday. The humble service of the washing of the feet is the antidote to the hypocrisy of the dirtying of the heads. As we begin this Lent, may we all come to know Jesus anew. In his saving humility, he washes the feet of those who don't know how to wash their faces. In today's gospel (Mark 9:30-37) the disciples are discovered to have been arguing about who was the greatest. In response, Jesus takes a child and declares it his ambassador, just as he is the emissary from the Father. As startling as this must have been in its own context, to take a powerless child, a nobody in the world, and declare it one's representative, in my own prayer through this passage this morning I began to wonder if it might not have an even stronger meaning for us, and especially for us priests. As happens frequently enough, I started to pray for those who have been abused by priests. Perhaps they, in a very particular and pointed way, are representatives of Christ in their crucified humanity. As a presbyter of the Catholic Church do I try to give myself the rotten and false consolation of telling myself that their crucifixion is someone else's fault? Or do I, as a priest of Jesus Christ and as one who at least desires to be a beloved disciple, seek ways to pray and weep at the foot of their crosses? The prayer of the father in the gospel today, 'I do believe; help my unbelief!' (Mark 9:24) is not really an expression of doubt. If we know well enough that Jesus is the remedy for our unbelief so as to cry out to him for help, then we already have all the faith we will ever need. Whatever our doubts or sins or even unbelief, all we really lack is the willingness to consent to the grace that God has already delighted to give us, to surrender to being the saints we were created to be in the first place. When I was younger I would pray for strength in temptation and for the courage to face the challenges of being a Christian. Now I realize that these graces are already here; it's not that strength and courage are spiritual commodities that have to be squeezed out of a stingy deity. The problem is that that my I'm still too stiff-necked and hard of heart to receive them. Nowadays, at my better moments, I don't pray for strength in temptation. I pray in thanksgiving to God for finding me worthy of sufferings by which I may show my love for him and at least present him with a token penance for all of my negligence, infidelity, and sin. I don't pray for the courage to live the Christian life, but for the willingness to surrender to the Life who is Christ living in me. I am willing, Lord, help my unwillingness. One of the most complex discernment and ascetical challenges in religious life is working through frustrated expectations. Everyone who comes to religious life arrives with expectations. Some are conscious, others not. The hard work, when faced with the disorienting experience of many things one expected failing to appear, is discerning which expectations were legitimate and which not. Many times the experience of frustrated expectations is a graced invitation to let go of our unreasonable demands and selfish 'needs.' We hope, secretly or openly, that the structure of religious life will provide the disinclination to sin we find lacking in ourselves. We want community and ministry to supply everything we have ever lacked in terms of love, care, and emotional support, without our having to do anything about it ourselves. Sorry. If we want to be loved just for who we are, we either have to be God or get a dog. On the other hand, sometimes our expectations are legitimate. As one young brother once said to me, "I thought religious life would be more...well...religious." In my very first days of religious life I was scandalized and confused that the brothers didn't genuflect to the Blessed Sacrament. When I asked about it I was rebuffed and told that I was scrupulous and rigid. But that was wrong. The brothers, and everyone else, ought to genuflect to the Blessed Sacrament. It's what we do in the Roman rite. But even that's not the real point; it's the least we can do before the great Mystery of the Presence. In those early years of my religious life, I think I came to be gaslighted somewhat, taught to second-guess myself all the time and thus fail to own all of my expectations of religious life, both the good ones and the bad. As I have grown up as a religious, a significant part of my inner work and liberation has been to recover my legitimate expectations of religious life and find ways to insist upon them for myself. That's my own story. My error was to be beaten down into second-guessing all of my instincts and expectations. But it would be just as bad an error to fail to let go of selfish and spiritually unhelpful expectations just because religious life as we find it sometimes also fails our legitimate ones. Today there was news of the death of one of our favorite teachers, Fr. Stanley Marrow, SJ. A seemingly cantankerous but really very gracious old Iraqi, every student he ever had is full of his sayings. The last time I saw Stanley, on a visit to the old Jesuit home, he showed me a manuscript that he had just completed. A commentary on 1 Corinthians, I think it was. He remarked how nobody would publish it. Not the conservative presses, he said, because his exegesis proved the non-existence of the sacrament of penance, and not the liberal ones, because he insisted on calling God 'Father.' In this, as in everything else, he was the consummate iconoclast. He was very insistent on the God the Father thing. When he thought our more progressively-styled school Masses were ashamed of it, he declined to attend, saying that he worshiped a different God. I remember once when he did come to a school Mass, he remarked that the music sounded like "something from a Moroccan whorehouse." During the same visit that I mentioned above, Stanley told me that he was praying for death. But, he said, the answer to his prayers thus far had only been, "Please stay on the line; your business is important to us." Underneath all the humor, though, was a very serious scholar of the Scriptures, and that's something we younger folks sometimes forget. You don't just get to be an iconoclast. You have to work for the privilege, and work long and hard. Before all else, congratulations! One of my fellow-ordinands, a man of extreme emotional reserve, remarked after the ceremony, "Now I know what Rahner means when he speaks of the 'physical redundancy' of grace." I shall offer my Mass for you some day this week, and ask the "author of our calling" to make your priestly ministry the unfailing source of your peace and joy. God has blessed you with an abundance of gifts, and the great beneficiary of that abundance will be those he entrusts to your pastoral solicitude. May you find in your selfless service of them the infinite satisfaction of saying, "We are unworthy servants; we have only done what was our duty." The quotes could go on and on. But I always respected how he responded when he was asked how he saw his work as a professor of Sacred Scripture: he said that it was his mission to minimize the damage his students were going to do to God's people. Refold alb and amice. 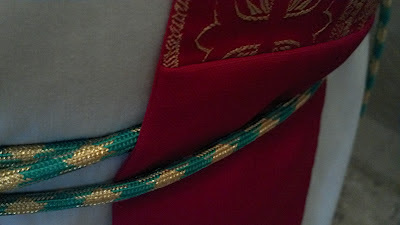 Tie it all up with cincture fitting for the next liturgical day. Put it in the book bag, hang the book bag by the door. I go places and I say Mass. It's what I do. Monasteries, parishes, chapels, route 9, Orange Line, Green Line, 9 bus, 7 bus. Break the trip in half to go to confession at St. Anthony's. Here's the intention for today. No, there's no offertory procession today. Yes, the ministers receive the Precious Blood. No, they do not. There will be announcements. Yes, the children need to be blessed as they go to hear the Word. The catechumens too, after the homily. The coordinator will remind you to give the pyxes to the nursing home volunteers. Sunday Mass one. Thanks for coming, Father. Have a good week. Sunday Mass two. Thanks for coming, Father. Have a good week. Sunday Mass three. Thanks for coming, Father. Have a good week. Binate, trinate, live your faculties to the fullest. I go places and I say Mass. It's what I do. After a while I feel scattered and a little homeless and I have that funny interior vertigo of someone who does the same thing over and over and I start to wonder if I'm really praying right, or even praying at all, but I don't care because I know this is God's mercy for me, a mercy he has been working in me since long before I had so many vain ideas to get in the way. Yesterday I put on Twitter the old gag about the recipe for holy water: take regular water. Boil the hell out of it. It got retweeted a bunch of times, and immediately I felt bad because I don't know if this is an old joke in the public domain or if it belongs to someone. So if it does, I apologize. Nevertheless, I like the joke for the theology embedded in it. It's not that something has to added to the water to make it holy; the holiness is already there (apparently) but for the hell that needs to be boiled out. Sanctity is not something new to be found, but a deeper identity to be uncovered as distractions, sins, and false selves are cleared away. Holiness is the real identity of the creature; we have just forgotten about and become distracted from who we really are. This is why the old advice we've been fed for so long, 'be yourself,' is so right, but at the same time often unhelpful. Of course we should be our real selves, the flourishing and happy saints free for compassion and care that God has created us to be. But this isn't something you can just do. When I try to just 'be myself' I usually end up reinforcing a false self and any number of vain self-attributions that I have wrapped like dirty bandages around the festering injury that is the lingering effect of original sin. Being myself ends up being a very hard and ongoing work that requires letting go of all kinds of stuff that I thought was me, of struggling to be free of the tyranny of the self, of abandoning what I thought was me in favor of the creature I am in the mind of God. This is why we're like the recipe for holy water. We are already saints, but for surrendering to having the hell burned out of us by the burning love of the Crucified, apart from which there is no way. Once I was trying to pray and I realized I wasn't praying but whining. I was trying to pray in contrition for my sins. By God's grace alone I noticed that I wasn't contrite. In fact, I was annoyed at my sinfulness. The same thing went for trying to pray in temptation. I might have thought I was praying for the strength to fight, but really I was whining to God about having to deal with being tempted. Sin bothered me because it wasn't really God that I loved. Instead, I was in love with the idea of myself as a holy person. My sins and faults kept pointing out to me that this wasn't the case and I was annoyed. This is the passion of vainglory. Sometimes a subtle commercialism would get into it too; I realized that part of me expected certain graces and holy victories in exchange for what I had 'given up' by becoming a religious. To our shame sometimes we try to sell religious life this way; the emotional rewards of ministry and the fraternal intimacies of community are supposed to supply what we have renounced by our obedience, poverty, and chastity. Of course this doesn't work out, and we can come to see ourselves, half-consciously perhaps, as cheated. The flesh, after all, fights against abnegation; it wants something in exchange for what it is denied. Failing that, it wants something to numb it, and any number of self-medications are readily available in religious life, publicly and to our shame: alcohol, food, internet, video games, etc. All of this is very pleasing to the devil. Not that he's happy. In fact, he's miserable, and that's part of why he wants everyone else to be miserable too. Every time I have any sort of trial or temptation--and by the grace of God they have become more terrible and subtle as the years have gone on--and I try to pray through the experience, the whine is there. It's the whining complaint of the unregenerate man who feels as though any suffering is an injustice to him, and any difficulty is an outrageous imposition. Fortunately and after some years I recognize him right away most of the time. I thank God for him as far as he teaches me the humility of knowing I have hardly made a beginning of living a spiritual life, and I turn my intention to thanking God for the tremendous gift of being tried or tempted. Trials and temptations are the school in which God trains us in letting go of ourselves, our arbitrary tastes, and our attachment to our moods, opinions, and cravings. Not that this is an end of in itself; the purpose of it all is to help us to a greater freedom for charity. God desires that I become free from the tyranny of self so that my love of neighbor can be more complete and transparent. That's salvation. That's the Kingdom of God. Fraternity is one of the big Franciscan things. St. Francis, when the Lord "gave" him "some brothers" said that the Lord revealed to him that he (N.B. not 'we') should live "according to the form" of the holy gospel. Francis called fire and the sun his brothers, and water and the moon his sisters, praising God for the fraternal bonds between all God's creatures. Sometimes we have a shallow idea of Franciscan fraternity, reducing it to something like conviviality or worse, co-dependence or the (un)happy intersection of the bad boundaries of one with unhealthy emotional needs of another. Therefore, I always try to be grateful to God when I'm able to participate in a real fraternal moment. I experienced one over this past weekend. I went with some of the brothers to a funeral Mass for a friar's mother. The friar was my vocation director, the brother with whom I met when I was inquiring into the Order, who encouraged me to apply, and who handled my application. I concelebrated the Mass, and as I prayed the Eucharistic Prayer, offering the Sacrifice for this woman I had never met, I realized that I had nevertheless known her. I had known her in the faith that she had handed on to her son, a faith that had given him the confidence in God to be strong with me about my vocation when I was having doubts about my application. I knew her as a member of the Body of Christ offered to God in that Mass, and in every Mass at which I have assisted or which I have offered by the anointing of the priesthood I have unworthily received. Back when I was first looking into the Capuchins, I could never have known and would never have imagined that thirteen years later, in offering the funeral Mass for his mother, I would have an intense opportunity to be brother to one of the friars who had been such a brother to me. But God knew it. I love the scene in the first reading today. Solomon presides over the dedication of the Temple, the Ark is brought into the Holy of Holies, and the glory of the Lord appears. I imagine the priests unable to minister because of the cloud of God's glory. Perhaps some simply stopped and adored in wonder. Maybe others missed out on the glory of God all around them because they were fretting about the ritual tasks and 'rubrics' they found themselves unable to complete. The scripture reminds us that there is a moment in prayer when there isn't anything left to do, not because we have done everything we could have, but because God, in his mercy toward us, draws us into the mystery of himself. We are drawn, even seduced, into the glory of God which we, in our limited and temporal state, can only experience as a cloudy darkness. But we know this cloudiness is the Glory addressed by all our doxology, this glorious Cloud the desire of our minds and hearts. At this point there is nothing left for the intellect to do. There is only our will in the sense of our desire for the One who has been conforming us to his own Beloved since our baptism. Religion, in the human sense, ends. Sometimes folks think they can go straight to this sort of prayer and experiential contact with God without first making use of the ordinary means of prayer and sanctification which God has revealed. On the surface this attitude seems enlightened and progressive and a way to avoid the conflicts that obtain between religions and between religionists and so-called secular humanists. But really this idea is a symptom of the shallow and pornographic nature of our culture, in its belief that personal intimacies can be acquired quickly, even instantly, and without ascetic struggle and work on the part of those willing to let go of selfishness in order to love another precisely as other. We want to be loved and accepted just as we are, as if we were God himself. We confuse love with the various and often very subtle lusts that only make others into players in our own dramas, immaturities, and confusions. We want to be instantly matched with our 'soul-mate' without letting go of ourselves for the sake of another, just as in the same way we want mystical experiences without ascetism. The good news is that prayer is the best school for learning the chastity that can love another precisely as other rather than as a pathological extension of ourselves. This is because God, in all his cloudy Glory and glorious Cloudiness, refuses to be a commodity, cannot be manipulated, and, to be a little silly but right to the point, has the best boundaries of anyone in the community. *I apologize both to God and to readers for the inadequate style. I don't know how to make small caps. I'm famous for not having the Christmas spirit, at least as the world conceives it. But today was an exception. After Mass I was to offer the traditional blessing of throats associated with St. Blaise. In thinking ahead about how I wanted to do this, I thought that after the final blessing I would put aside the green chasuble and stole and put on the red stole appropriate for Blaise, bishop and martyr. Only after doing this did I realize that I ended up wearing a red stole with the festive green cincture I use for Sundays in Ordinary Time. So I felt very Christmas-y for once. For the rubrical reference made in the title see the praenotanda of the De benedictionibus (Book of Blessings) number 37. I'm moving into a transitional space at the end of month in preparation for my big move to Rome in the spring. So in these days I've started to think about how to deal with and store my stuff. In this effort, I'm trying to give some things away. The student friars in the neighborhood can make good use of some of the books and religious equipment. It's better than packing things up to sit lonely in a friary basement. I love the feeling of letting go of stuff. There's a liminality to it, and a certain primal sensation of freedom. I always feel curiously alive when I'm packing up and moving. This is a little window at one of the places where I celebrate Mass regularly. I find it fascinating and like it very much. 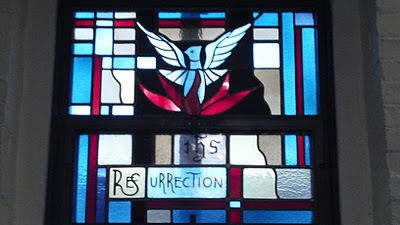 The dove rises from the fire, a double image of the Holy Spirit. It's almost phoenix-like, isn't it? (Does one say, 'phoenician'?) Beneath the fire is the Holy Name 'IHS' and then the label: "Resurrection." And yet, it's not an image of the Resurrection, but of the Holy Spirit. It reminds me that when we talk about, pray on, and find ourselves invited into the mysteries of the Resurrection, the accounts of the appearances of the Risen Lord to the apostolic generation, the various handings over of the Holy Spirit as they are recorded in the New Testament, it is actually quite difficult to know just how it is we are talking about different things. The sacrifice of the Cross, the Lord's death and descent to the dead, the passing of his divine humanity into the new life beyond history but now erupted backwards into it, and the handing over of the Spirit who is the abiding presence of this Event among us and the animating principle of the Church, all of this is the one Paschal Mystery of Christ. This post may get me in trouble and I don't care. It's all in fun. Some of it anyway. Yesterday it was my turn to make supper here at the friary. As I spent the afternoon mashing potatoes and attending to my pot roast simmering away amid onions and carrots, I thought that the brothers were really going to like their meal. And indeed, they ate it all up. As I was cooking something funny struck me. As generally 'left-of-center,' 'liberal,' or 'progressive' mainstream religious life is about religion and liturgy, it is certainly traddy about what it wants for dinner. Religious might be slightly or not-so-slightly allergic to the traditions of the institute and those of the faith in general, but they sure seem to prefer a traditional meal. Some real-life examples will bring my point into focus. It would be just as transgressive to wear black vestments, or, God forbid, want to pray in Latin or sing Gregorian Chant (even though these remain norms to this day), as it would be to try to serve a meal that wasn't in accord with the traditional, American, meat-centered diet. This is amusing to me in part because of one of the doctrines I was taught in my formation in religious life: that of the 'two tables.' It was said that our common life revolved around an axis formed by two tables: the one being the altar of the Eucharist, and the other being the table of the dining room or refectory. Now like a lot of things I was taught early on in my religious life, I have come to critique this teaching. I think it has been to easy a path to certain enervating errors from which we suffer, but that's another post. I just think it's funny that at one table traditionalism is prized and unorthodox experimentation condemned, while at the other table things tend toward being the other way around. I guess I would feel a little more at home if things fell the other way, but who knows. But don't mind me, I'm going to put on my black maniple and make some quinoa for lunch. Here's a liturgical question. I'm interested in hearing thoughts and opinions. I've been helping out with Masses in two South Boston churches lately, St. Brigid and Gate of Heaven. They are separate parishes canonically, but have one pastor, one parish office, one staff, and one bulletin. Thus, though they remain two parishes, they are very much associated with one another. My question has to do with the observance of the liturgical day tomorrow. It's a ferial day in the general Roman calendar, as well as in the proper calendar for the United States, the plain old weekday in Ordinary Time that is the standard example of low solemnity. It is also, however, the feast day of St. Brigid. At St. Brigid's, the answer is simple. It's their titular feast day, and so the Mass of St. Brigid would be offered, either with the Commons from an American edition of the Roman Missal, or with the proper prayers, which I suppose one could use if he considered South Boston to be a suburb of Ireland. I checked my Commonwealth English breviary; Brigid is a feast day there, as well she might be as patroness. I, however, have the Mass at Gate of Heaven tomorrow. Given the strong association of the place with the other parish, as well as the fairly intense Irishness of the place, ought I to use the Commons to offer a Mass of St. Brigid? As I said, the day is otherwise free to select 'any Mass' for just cause or pastoral advantage. Or would it be better to respect the individuality of the place by not doing so? Of course, should he say anything, I will do as the pastor directs. St. Brigid, pray for us. Happy spring, happy Imbolc, and happy whatever else you would like to be happy about.